For the Salmon: Season the fillets with olive oil and sprinkle with the condiments on both sides. Cook the salmon on a hot grill for a few minutes, skin-side first. Flip over when the skin has browned. When the fish has cooked, place on a tray and remove the skin with a fork. For the sauce: Combine all the ingredients in a bowl and serve over the salmon. This dish has a truly exquisite flavor. I recommend using salmon fillets with the skin on to prevent them from drying during the cooking process. You can use mahi mahi instead of salmon. You can serve this dish buffet-style, accompanied by white rice and green salad. The celebration our little girls' 15th birthday is undoubtedly a very special occasion for Latino families, a moment that will forever remain as unforgettable. To do them justice, I searched for recipes that have the appropriate touch of glamour for a quinceañera. It's best to stick with simple but elegant ingredients like salmon, which not only has some sophistication but is also affordable and readily available. So let's get cooking! 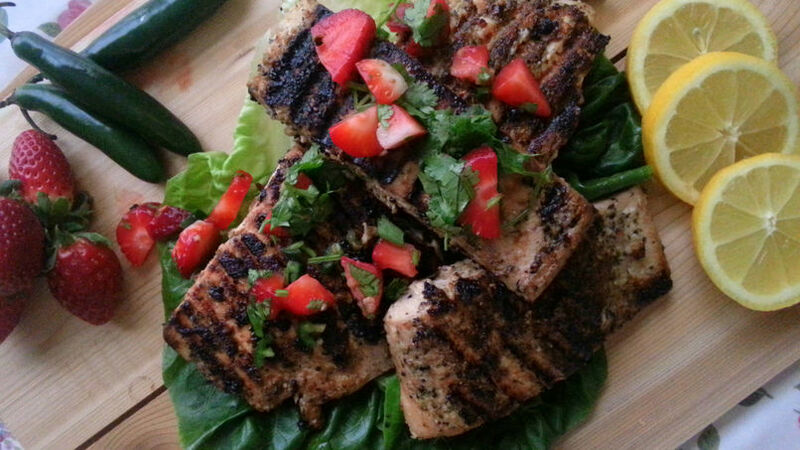 Discover this delicious grilled salmon with strawberries. It's sure to be a gourmet delight that everyone can enjoy… especially our beloved quinceañeras. Enjoy!